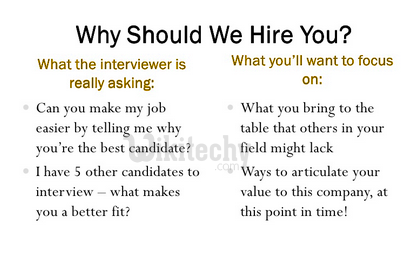 Home HR Interview Questions and Answers Why should we hire you ? 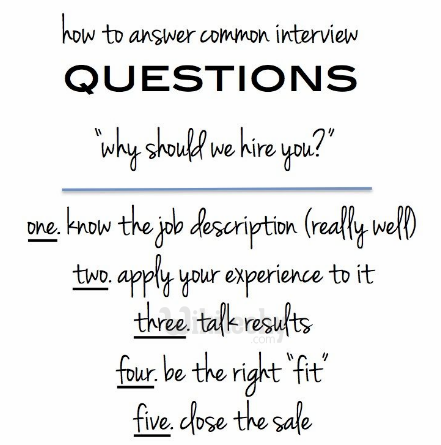 If an interviewer asks you, this question in an interview, the interviewer is giving you the opportunity to sell yourself. Think of yourself as the product. Why should the customer buy? They need a good reason to give job to you. To understand whether it make sense to invest all money in you. To understand whether your employment can be a good investment for them. They want to hear that you could help their company to grow, and they want to hear that you actually care about their business. They desire to know your motivation. Because I am the best candidate for this job. Because I want this job so badly. As, I have just started my career, I don’t have practical achievements, but I really want to practically explore and experience my potential by delivering the best services to the company. It will be my honor to work with you and this organization. Sir, being a fresher I need a platform to enhance my skills and to prove myself. If you hire me it will be a great opportunity for me and I think this will be the good platform where I can upgrade my knowledge and skill and be a part in the development of company growth. Related Searches to Why should we hire you ?